Do you want your business to be perceived in a certain way? Do you want your customers to remember you and describe you or your business using certain words? Then you need key messages. 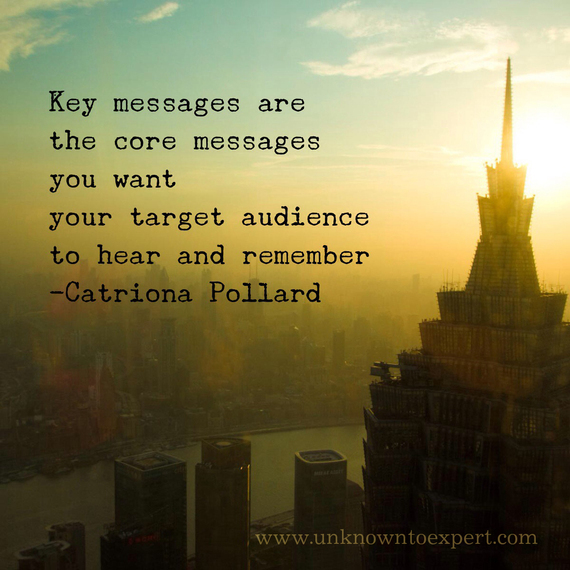 Key messages are the main points you want your target audience to hear and remember. They create meaning and headline the issues you want to discuss. They allow you to control communications, enhance relationships with your target audiences and are an important feature of a PR campaign. To ensure you get your point across it is essential to establish your key messages before any communication with the media or your target audience. Is it believable? Make sure your core message is supported by evidence. Is it easy to understand? Make your language concise, professional, and to the point. Is it positive? Be positive and use active language. Is it purposeful? Make sure your message represents your agenda appropriately. Remember your key messages should be short and specific. Make sure you work out the most important core messages that you wish to portray and write simply but with enough interest to provoke your reader. Consider your target audiences. What do they need and want to hear from you? Do you have multiple target audiences? If so, ensure you tailor your target messages to each individual group. Quite often, what we say is not always interpreted or heard by the receiver in the same way. Influencing the perceptions of other people is not an easy task. However, developing key messages that are clear, concise, honest and positive will put you in control of the information that is 'out there' and allows you to influence your audience in the most effective way. Always be aware that your key messages are not static. Everything changes over time so reviewing your key messages regularly is vital in making sure they are still relevant and reflect your core business messages. So when creating your key messages, think, are they relevant, positive, and consistent? If you can tick all these boxes, it won't be long before your audience identifies you as an expert in your field and thinks of you as a thought leader. Business Communication Public Relations P.R.